Here is a picture of our latest visitors here in Oklahoma City. Kevin and Jean Gore from Walkden, Greater Manchester, England. They visited and stayed with us for two evenings and about two days. I first come to know the Gores in 1998 as I was preparing to leave for my mission to the UK. The Bishop from the Hazelton Ward, Paul Tateoka, sent word through his brother in my ward, Ted Tateoka, that I needed to call this couple from the UK. The Gores were staying with one of the missionaries who had brought them into the church, who lived 5 miles or so down the road from me. I called the Meacham home and had a nice visit with Kevin for about 30 minutes or so. I obviously had my mission call, but I do not recall knowing that they lived in my mission. Kevin knew I was in the mission so he told me a few interesting things and we hung up the phone. I admit I completely forgot about this conversation with Kevin Gore until my first Sunday serving in the Eccles Ward (now Swinton) of the Manchester England Stake. I stood there shaking hands with members and introducing myself when a man asked if I was Elder Ross from Hazelton, Idaho. I apparently looked dumbfounded so he informed me that I had spoken with him on the phone before my mission. Granted, this was the first time I laid eyes on him. Well, that started a relationship that has now come down through the years. I served in the Eccles Ward for about 6 months, although since there were two sets of missionaries, me and my companion had the other half of the ward. The Gores were probably one of the closest families I had in that ward, although there were a couple. Before we left late in 1999, Kevin and Jean Gore treated all four of the missionaries to a very nice roasted duck dinner. Time has a way of marching on, and so it has done with this friendship. Brad Hales, Amy Hales, and I visited the Gores again in the summer of 2003 when we went to England for a convert baptism of a lady who Elder Hales and I had once taught (in Runcorn Ward). I think we spent two evenings with them at that time, although our time was limited because they were working and we had other people in the area we also visited, but Jean made us a roasted duck dinner again! We did not request it, but she made it, and it was fabulous. We again enjoyed our time with them, although limited. The Gores were kind enough to invite us to the wedding of their son, Ian, in Springville, Utah in 2004. Brad Hales and I visited, partook of the food (no roasted duck! ), and enjoyed a good evening with our British friends. The Gores came to visit Utah in 2008 again, but we were only able to enjoy a light dinner at Olive Garden together (again, no duck, only in England!). Amanda and I made the trek over the water again in 2008. This time we again spent 2 nights with the Gores in their home on Trinity Crescent. Both in 2003 and 2008 I knew the neighborhood well enough I could still drive to the home without much difficulty. Jean once again made her now famous roasted duck dinner! I honestly think this is the only times I have ever eaten duck in the past decade, if ever in my life (other than what they call duck at the Chinese buffet). The Gores were more than kind in allowing us to stay with them, use their computers, talk family history, and even hosted a little get together of other members of the Swinton Ward I still knew and asked about. 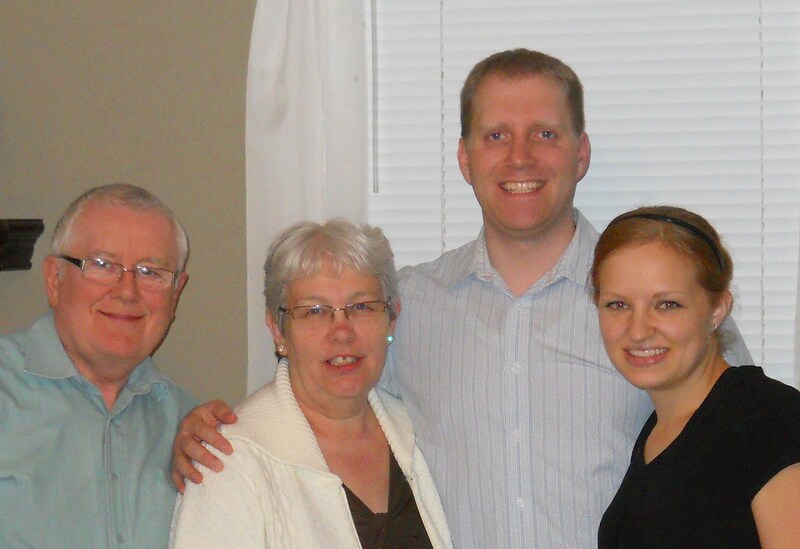 Here we are in 2011, 13 years later after the phone conversation, and the Gores have come to visit us! Sorry, we did not treat them to a roasted duck dinner. It would have been an insult to Jean’s cooking. Their son, Ian, had moved from Springville, Utah to Bentonville, Arkansas. Kevin and Jean wanted to come down to visit the Oklahoma City Temple and, we feign to believe, us. We drove out to Pops Soda Shop in Arcadia. We also ate out at our favorite little Mexican joint and then we treated them to capers and artichoke pasta the night we made them dinner. We played a couple of games of Ticket to Ride and just enjoyed our time together. Thanks for being such great friends and keeping in contact through the years! When is the next time we will see the Gores? And, the question you all want to know, will there by duck involved? Tonight we write from the deep countryside of Dorset. We are staying in the little village of Milton Abbas with a cousin’s cousin. We are both related to the Coley and Harris lines in Halesowen, England. Peter and Cynthia Wise have taken us in a day earlier due to the fact we are not going to Merthyr-Tydfil, Wales now. We will be with them two days. Yesterday went terribly wrong. We left a little late from Walkden, got stuck in a traffic queue for 1.5 hours in Stockport meaning we had to drop our visit to Chatsworth House. Then we decided we better drop Mattersey and Misson on my Sharp family line to at least make Sudsbury Hall. We then found out the M1 was closed with miles of traffic queue so we had to take side roads to Nottingham. There we saw the Robin Hood sites and made our way to Sudsbury for their manor house. Well, all the side roads were occupied with motorway traffic so we were delayed, we got lost, and in the end missed the last time to get into the home. We got pictures with the house but Amanda was devastated we didn’t get in. In defeat, we made our way to Hagley, near Halesowen, near Birmingham last night. We checked into our little hotel and ran into Halesowen where we found the church of St. John the Baptism. Interestingly, as we wandered the cemetery, we found loads of Coley, Willetts, and Harris tombstones. Many were modern, but there were a few in which I am sure they are cousins I have in my family history file. That made it worth it. The other deceased I will have to do some research on to trace them back to the family and connect them in. Hopefully I can find another person who has done research on some of the same lines and can help me with my research. We shall see. Today we toured Romsley, Hayley Green, and Bromsgrove near Halesowen, more sites of Coley ancestry. We wandered and took more pictures in St. Kenelm’s church. There were more Coleys and Willetts found there. I was pretty excited. None as old as in the Halesowen church, but you never know. We hopped on the Motorway and went through Worcester, Gloucester, and finally to Bath. There we saw the Royal Crescent, some of the Victoria Gardens, and the Roman Baths. It is a beautiful city. We enjoyed ourselves. From there we wanded to Milton Abbas way out in the countryside. We drove several miles through one car-width lanes to this village. We are still figuring out what we will do tomorrow. At any rate, it should be fun. Just a quick and short update. I uploaded photos from Scotland this morning. I hope you find them interesting. We will see how many more photos it will let me upload for the month. We are now staying with the Gore family in Walkden. We arrived later than anticipated after a day of visiting in Runcorn. We attended church in the Runcorn Ward at the local community center since their building burned down a while back. It was good to see so many people and that we received such a hearty welcome. We did go visit a number of families while there. A couple of which include the Campbell (and Young), Fleming, McWilliam, Johnson, Byrom and more. A couple of families were not home so we did not visit with them. It was sure good to be back in Runcorn, despite the fact that you have to drive around in circles to get anywhere you want to go. Busways might be spectacular, but at the sacrifice of the drivers! Saturday we made another trip into Liverpool. The only thing really to mention is that we got lost and had lunch with Gheorghe and Claire Simion family. Gheorghe was one of my mission companions. We spent nearly four hours with him and his good wife. It was convenient he lives in Liverpool now as he was originally from Romania. It was a great meeting. We are off to Hyde and Disley today. So more a couple of thoughts on a variety of issues. I am learning more and more there is only so much some people can be helped. I have a friend, Kevin, who says he cannot find a job. I have now given him over 4 different job opportunities and he isn’t willing to do much. Granted, it might not be the perfect fit, but why not jump in until you find something better. I guess there is always the benefit of sitting and home and hanging out with the family. The money doesn’t run forever (at least, for most of us). I thought he was interested enough in a job that I set up an interview with the two individuals doing the hiring. He went and brought his wife along for the interview. Why not bring your mother too? How far should one go in trying to reach out and provide opportunities to another? I was visiting with my boss, Doug Kelley, the past few days about the Catholic Religion. Particularly with the Pope’s visit to the United States and his news noted attempt to try and bring the US Catholic portion in line. My boss, a self proclaimed “Roman Catholic with a little R” said the real issues he has with Pope Benedict is his apparent desire to undo Vatican II. Primarily the fact that with Vatican II the church was less authoritarian and the congregations could really take on responsibility and serve on another. It is always the Father out doing all the good while everyone sat around. Now the Pope is diverting the church back to the authoritarian mode and he is very frustrated. My first thought is he should definitely take a look at the LDS. If he wants a congregation that serves on another, I don’t know of a better church. We talked some about Mormonism and I even gave him a Book of Mormon. He was thrilled and said he would read it soon. I very much hope he does. The sooner the better. I won’t be around him for years to finally discuss and talk about it when he does read it. I have been accepted to Oklahoma City University Law School. I really like this option. It takes me back to the center of the country, I get to live in another area I never lived, and in some cases another culture. We are still waiting to hear from some other law schools for which I may be interested. There certainly is no rhyme or reason to why schools accept or reject applicants. I have acceptance to schools better than others that rejected me according to some ranking systems. We shall wait and see. In sitting down one morning to breakfast with Marie Lundgreen, she asked me what I thought about the relationship with her and the sister. This Sister seems to have a relationship which may be similar in many ways with my own full sister. The giving of great opportunities are not only rejected, they are turned back on you in a negative way as trying to interfere in their life. Where credit or help is given, not only are they taken, but no recognition or appreciation is given. In one case with my own sister, my willing to help her out cost me a vehicle and several thousands of dollars. What is one to do? Marie and her sister, over a period more than double my sister and me, has been more extreme. In some instances the help offered cost thousands of dollars, and then it was all rejected part and parcel. Even after acceptance was agreed upon and all the effort expended, then the gift rejected. What is one to do? How much should we extend ourselves to help those, especially family, where it seems to do more harm than good? Nobody likes to be taken advantage of in any way. I do think I am magnanimous, but is there a point where you should take your efforts elsewhere? What happens when you know later the sister is being kind and nice just to get something more? Forgive but not give the gift? Is that possible? Dad and Jan have been called to serve for two years in the Twin Falls Temple when it opens. This is an exciting opportunity. It will be a calling close to home, the privilege of officiating in the House of God, and the spiritual blessings that only come from the Temple. I hope and pray the couple days a week they serve will not cost him his job. I guess it doesn’t really matter. We are all in the hands of the Lord of the Harvest. Dad and Jan have been called and they will give their all to serving. As anyone does so, everything always works out. We don’t know how, it just does. The same has been very evident in my life. I had dinner with Kevin and Jean Gore from Walkden, Lancashire, England. What a joy it was to meet up with friends from within the England Manchester Mission. Just like the sons of Alma after meeting up after all those years, nothing has really changed in the relationship. Why, because we all live the gospel. As we keep our hearts in tune with the Savior, we cannot help but find ourselves in tune with others who are seeking to do the same. We enjoyed a great meal and discussed a wide variety of topics. I thank God for how kind and generous he has been in my life. There are so many great and noble people I have the privilege of association. Work continues very well. There are some things in the pipeline which will do great things in expanding the production of Magnesium Hydroxide at the Paul Plant. It is just a matter of getting everything lined out and ready to go. There are a host of equipment opportunities and I am sure there are many more. We have met with a couple of engineering firms lately all of who are interested in our equipment and services. There are some tremendous opportunities. I hope we can get them on line before I possibly leave for law school. I know this post has been a bit more negative. I just needed to vent I think and relieve the concerns I have. The future is so unknown, you try to help others out and they don’t want the help (such a fine line between meddling and genuine service), and the desire to anxiously engaged. What comes next?